We are an established Sign Co. going on its 19th year of business. Our strategy is to keep a long term relation with our customers. Every business transaction is with our customers in mind. Once you've felt our personal attention to details, you will find we are here to serve you, and second to none. 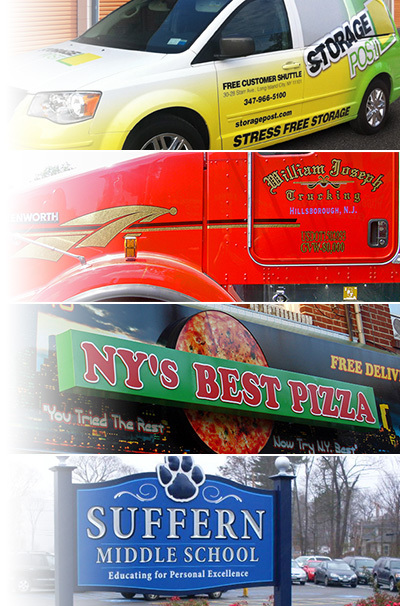 We provide all graphics for the industry and general public, from fleet graphics for business in quantity, to a small truck lettering job for the individual small business. Here we will take any artwork and send it back to you in digital printed form, either on vinyl, backlit, banners, etc.. We will perform any application for vinyl graphics vehicle wraps, from buses to trains. We offer an array of different types of signs, from wood, magnetic, backlit, channel letters, neon, etc..
Feel free to call us direct for a free quote. We are located in the tri-state area serving local businesses in NY, NJ, CT and shipping Worldwide.